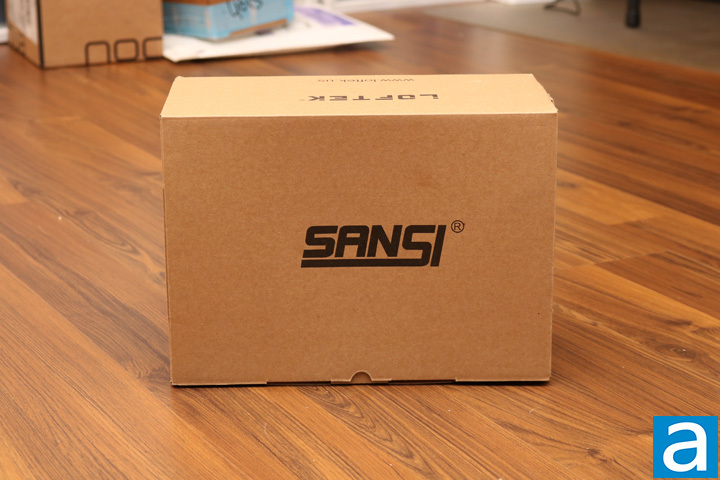 The Sansi C2440-FW arrived in a medium sized shipping box. As you can see from the picture above, barely any damage was done to the package. It was shipped via Dynamex and they did a good job at it. It shipped from Mississauga, Ontario, Canada, all the way to Calgary, Alberta. Even though it shipped from within Canada, it is still across the country and was quite a long journey. I am impressed with how well the package looks considering the long travel distance. As well, inside was a bunch of plastic bags filled with air to ensure the product does not bounce around inside. All in all, the package arrived safely, and I had no doubt that the retail packaging would have no damage done to it. The retail packaging is nice and simple. 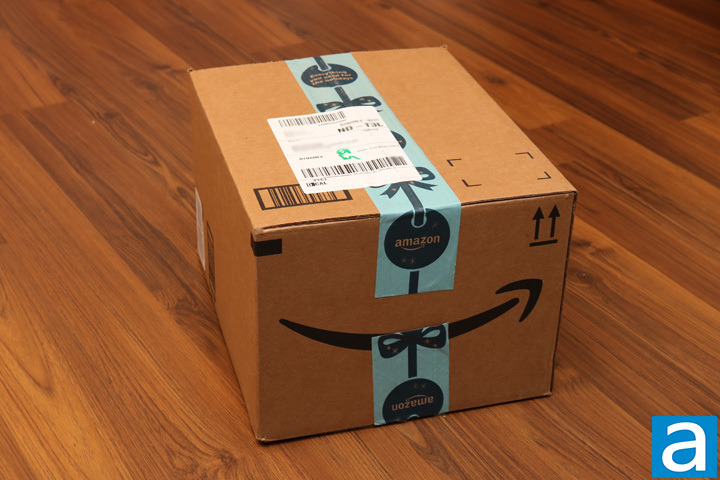 The box looks almost entirely like the shipping box with the same brown color. On the front, we find only the company name, Sansi. The rest of the box does not really change much either. On the one side, we find a small sticker with all the specifications on it. On top of the box, the Loftek name is found as well. Sansi definitely cut some costs on the retail box, but all the required information is present. It is easy to tell that this is not a gaming product, but purely one for utility. There is no need to make it extremely flashy to grab attention. If you need a security light, then you need a security light, haha. Inside of the retail packaging, we find a few things. The security light takes up the majority of the space inside and it sits snugly in a cardboard mold. The C2440-FW will not be bouncing around inside of the packaging. Otherwise, Sansi also included all the mounting hardware required and a fairly detailed instruction manual. I actually would have preferred to have seen some more padding included inside. It seems a little limited, although our security light arrived in excellent condition. The product is fairly large with two heads carrying four LEDs each. Its length comes in at 317 mm, width at 189 mm, and height at 174 mm. The majority of the Sansi C2440-FW is made out of plastic, but not cheap plastic. It is firm and strong, while it does not make the weird plastic creaking that cheaper plastics make. The plastic construction also ensures the product is lightweight. Metal construction would have been better, because plastic can easily break or crack if the light is dropped or accidentally hit with something. The heads themselves are quite flexible and can be adjusted to point in all sorts of directions. It is also difficult to move the heads, which is good because then they will not be easily moved by anything outside. 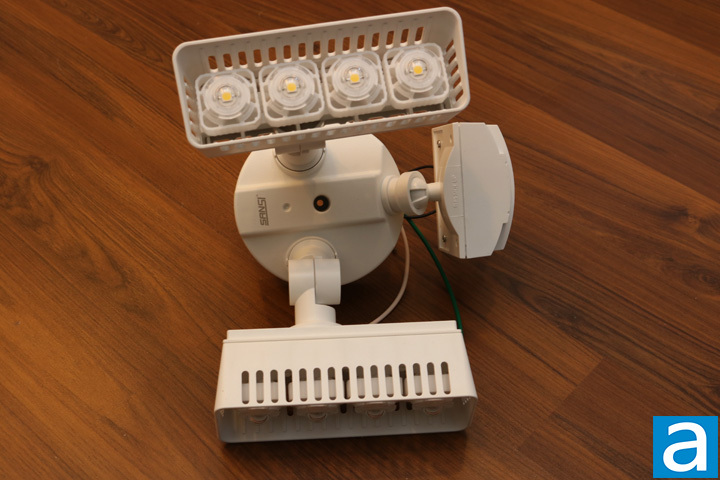 Each of the four LEDs have a hard plastic dome covering them, protecting the actual LED from the environment. Sansi advertises one of the features of the C2440-FW is a ceramic heatsink. LEDs can generate a lot of heat depending on how long they are on for. A heatsink is definitely necessary. After inspecting the product a little closer, I think the ceramic heatsink is a big rectangle right behind the LEDs. All in all, the Sansi C2440-FW is well constructed, and can be applied in many different situations. The different modes that can be used are found behind the sensor module. There is a test mode just to ensure the wiring was done right and so on. The instructions say one must wait for one and a half minutes for the system to calibrate before the light will go on. In test mode, the light goes on instantly and stays on for five seconds. In motion sensor mode, the light will go on for either 1, 5, or 10 minutes. This can be set using the bar at the bottom. The manual mode means you can turn it on and off whenever you like, however, during the day the sensor will automatically take over. The sensor senses light as well, and so if a light is directly pointed at it, it will not activate. The range can also be adjusted so things too far away will not trigger it, such as cars on a nearby road. 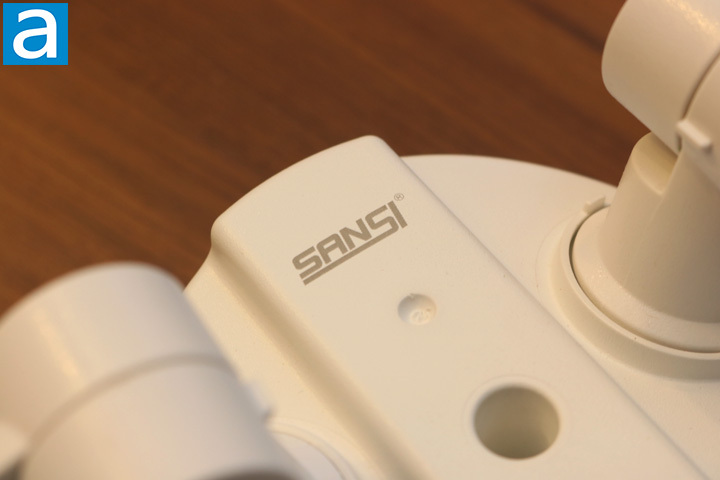 Sansi gives one quite extensive control over the light, as it should be. Shown in the first photo above are all the mounting hardware. The instruction manual is quite clear on installation and we did not have any issues. My colleague Jonathan and I connected the wires to a standard three-prong power cable, so it can be powered by a standard wall outlet rather than hardwired into the building. We simply had to strip the wires and use the included yellow caps to tighten them together. In the second picture, you can see what the caps look like. They easily twist the two wires together and are hard to remove after they are twisted on right. 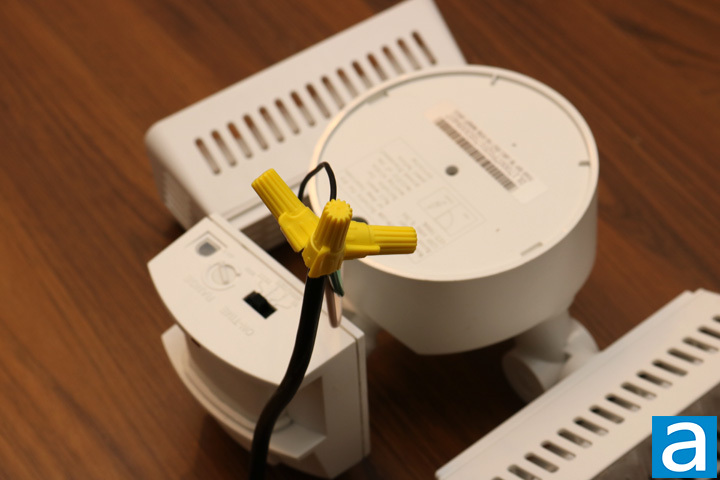 The instruction manual is also clear on which wires should be connected to each other, while also ensuring clarity on installing the mounting hardware. Sansi's manual is effective and one should not run into any issues during installation. 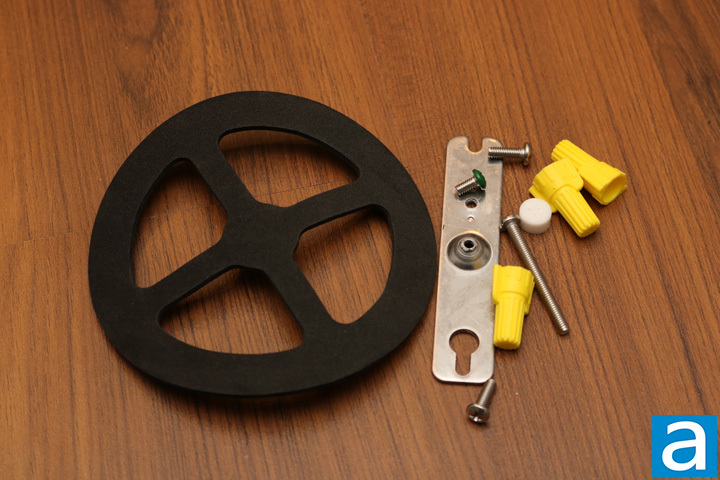 There are only a handful of parts and no soldering is required. As you can see from the above picture, the Sansi C2440-FW creates a really big flood of light and does so quite well. The light is bright and lights up a big area. For a security light, it is beneficial for it to easily light up a huge area, which the C2440-FW does. Another thing to note, the sensor is fairly sensitive and should not be mounted close to vents. But the sensitivity is good to ensure it catches all the movement in the area. It would be great to have an adjustable electronic filter for the sensor to prevent it from sensing something like steam coming out of a vent and interpreting that as motion. 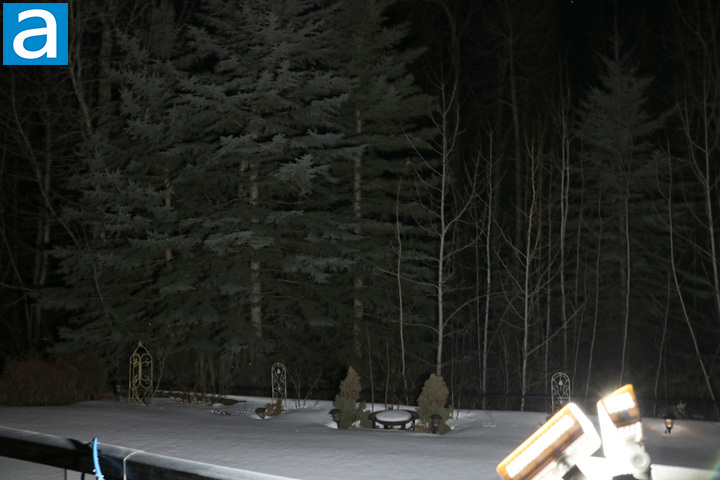 If the always on mode is activated, then the security light will automatically turn off when light is directly pointed into the sensor, so sunlight will turn it off. In all the other modes, this also means the Sansi C2440-FW will not detect movement during the daytime. The Sansi C2440-FW will definitely spoil a game of night at the museum, but will definitely ensure whatever comes onto your property is detected. Security is of course an important factor when it comes to outdoor lighting, and the Sansi C2440-FW will definitely help in that area. It lights up a large area and does so well with its bright light. The construction of the Sansi C2440-FW is good. Most of the light is made out of quality plastic, which works well in an outdoor environment and keeps it lightweight. Metal construction would have been better, but we have to consider the price. The ceramic heatsink ups the build quality and prolongs the LED lifespan. The C2440-FW is waterproof and should survive in rain or snow. The large heads also swivel easily, while the installation is clean and easy. The sensor is sensitive and Sansi provides enough control over when and for how long the light will go on for. The Sansi C2440-FW comes in at $60 USD, which is a good price for a security light of this caliber. My only recommendation is to design a sensor with an electronic filter so environmental factors like steam will not trigger the light. 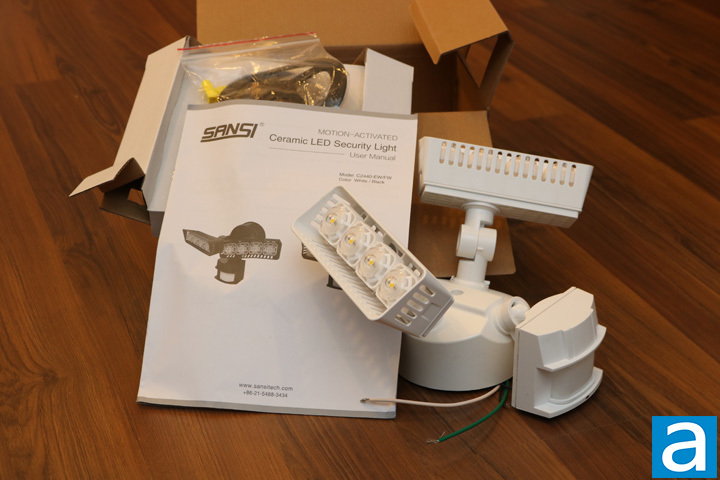 Overall, Sansi has created a great security light at a competitive price that works well. 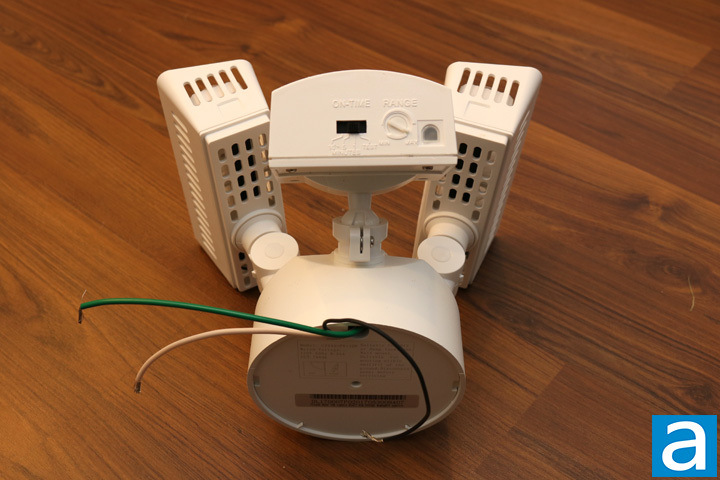 Sansi provided this product to APH Networks for the purpose of evaluation. The Sansi C2440-FW is a motion-sensing security light with good build quality at a competitive price. Do you have any comments or questions about the Sansi C2440-FW? Drop by our Forums. Registration is free, and it only takes a minute!